We trade ORIGINAL vintage collectible signs only. You can get anything and everything related to Collectible Signs, Antique Signs, Old Signs, Vintage Signs. 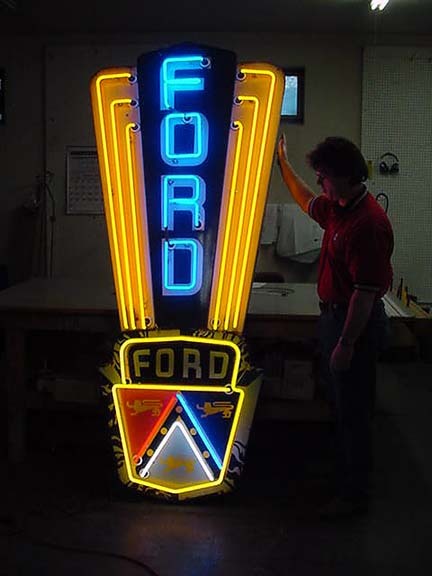 Moreover, Porcelain Neon Signs is the gem of our collection. However, there are various other varieties of collectible advertising signs. These days, vintage signs of Brewania, Oil & Gas, Automobile, Pop and Barber Shop, Soda, Petrolania, etc. are in huge demand. These are just a few we handle. Our vintage signs collection also include signs of Fashion, Tobacco, Cigar, Taxi Cab, Automobile, Fire Department. We have a special gallery for the transportation sector. Those include signs of ships, boats, plane, car, truck, bus, etc. If you are an automobile enthusiast and want some signs to decorate your garage, perhaps you are at the right place. Signs of brands like Chevrolet, Pontiac, Ford, Plymouth, Dodge, Marmon, Buick, Studebaker, Rambler REO Trucks, etc. are a few of our broad collection. Now you might be curious to know, how came we collected so much advertising vintage signs? Yes, we do have a vast collection. But that’s not an overnight success. We toiled hard searching and gathering vintage signs from around the states. That took us 30 years. So, we not only serve you with genuine signs, but our experience secures you that whatever you are purchasing is totally intact, with a rich history and in excellent condition. There are various dealers in the market dealing with antique signs. They don’t know the difference between a fake and an original vintage sign. That’s where we have an edge. We don’t speak, our experience speaks. If you are planning to spend money on vintage signs, do some homework first. Try to gather as much information regarding the sign you are planning to purchase. Learn to differentiate between a fake and an original vintage sign. Chances are very slim; the store owner will give you proper information before selling. They don’t care about the history and trends of antique signs. All they think is, a sign is just a sign. While there are others, who will say anything to sell you the sign. Beware of those frauds. We are the only dealer backed by experience, reputation, and collection. These days, I come across various calls and emails regarding the value of the sign. But I don’t entertain those calls and emails because I am not in appraisal Business. We Buy, Sell, Collect good Collectible Signs. Private auction managers are calling to get an idea about the highest bid of their sign. They know me, and the way I deal with Antique signs. Not to mention, I bid higher for a vintage sign if I like the history and condition of the sign. Therefore, if you are planning to call or email regarding your sign price, be ready to get a twisted response. Because we won’t share “What’s your offer” We will rather evaluate and give you a price with a little scope for negotiation. If things fall into place, I will cover the shipping cost of the collectible sign. Since our profit is very less, we might not negotiate on some of our vintage signs. One thing for sure, buy with full confidence. If you feel like you purchased a fake article from redhot-roadrelics, chill. You are covered under the money back guarantee excluding the shipping charges.